Ioana Crişan's research (Reghin-Mureş, Romania) contributes to establish the continuity of Tartaria signs and Danube Script in the collective memory. The Danube Script appeared some 7,000 years ago in the Danube valley: in Serbia, Kosovo-Metohija, Southern Hungary, Romania, Bulgaria, Macedonia and northern Greece. It flourished for one and a half millennia. Around 5,500 years ago, a social upheaval eclipsed this and other elements of the advanced culture of the Danube Civilization. Some researchers argue that there were devastating invasions of new populations from the steppes while others have hypothesised the imposition of new dominant elites. Over the last seven thousand years, and continuing today, traditional pieces of folkloric art (from carpets to clothes) are being produced that continue these ancient signs. The lozenge, the X, the E, the b, the D, the M, the circle, the angle, the tree, the spiral, the angle, the cross, the rosette, short parallel lines are highly productive and persistent motives attesting to the Neolithic Script. Whilst Tartaria signs have not lost their popularity over the millennia as decorative motives, it remains the case that in rural tradition they are not purely ornamental elements but allusive expressions of religious ideas, codes associated with magic powers and basic symbols relating to the divinity and its epiphanies. Powerful geometric motives continue to be transmitted from mother to daughter, as Ioana Crişan witnesses herself as she inherited the beautiful collection by the mother who inherited from her own the mother. She continues working to complete the collection. That Neolithic-Chalcolithic Script also inherits this marked preference for abstraction and schematisation in the decorative design of folkloric art. Close to Tartaria, a small rural Transylvanian village of 5,000 inhabitants some kilometres from the well-known site of Turdaş, Nicolae Vlassa (an archaeologist at the Cluj Museum) in 1961, unearthed three clay tablets, covered with strange signs, together with a small cache of offerings, accompanying the charred bones of a mature human, estimated to be 35-40 years old. The accompanying artefacts, suggest this person was a Great Priest or a Shaman and that he was cremated during a sacrificial ritual. 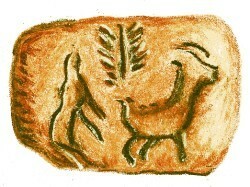 The archaeologist, who made the discovery, suggested the (unproven) hypothesis that a cannibalistic ceremony took place in Tartaria. These three small, inscribed tablets started a debate that is challenging the conventional wisdom of European prehistory, because they have been dated from around 6.500 years ago.¹ Some scholars argue they date even earlier at 7,300 years old.² More prudent researchers, date the stones to 6,000-5,800 years ago. In any case, the astonishing question is did the South-eastern Neolithic Europe develop its own script before Sumeria and Egypt? Given the context of the finding, the tablets from Tartaria are probably amulets or votive tablets. The clay is grey-reddish and crystallised, to the point of looking like tuff. Careful observation and analysis is needed to ascribe to them their potential value as a written document as they contain much more than ascertained from a cursory examination. Technical analysis of the Transylvanian tablets that the inscriptions are not simple signs or randomly distributed insignia, rather the inscriptions are characters from some type of writing system. There are three reasons for this conclusion. Firstly, it is easy to find similar signs also on other artefacts of the Danube civilisation, pointing to the fact that the characters of the Danube Script follow precise standard shapes and that scribes made use of an inventory. Secondly, the characters of this proto-European script, when compared to other archaic writings, are marked by a high degree of stylisation and a rectilinear shape. Thirdly, we may reasonably assume that the information communicated by each character was a specific one with a univocal meaning. Today, village life and its visual art and folk memory, has the capacity to reveal the heritage from Neolithic times through the importance of Tartaria signs, created thousands of years ago but of continued authenticity. 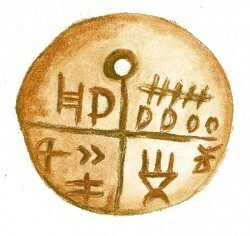 As Crişan's article documents, in some Balkan-Carpathian rural areas, the Danube Script characters occasionally revived to enjoy a popularity they originally possessed in the early period of Danube civilisation.